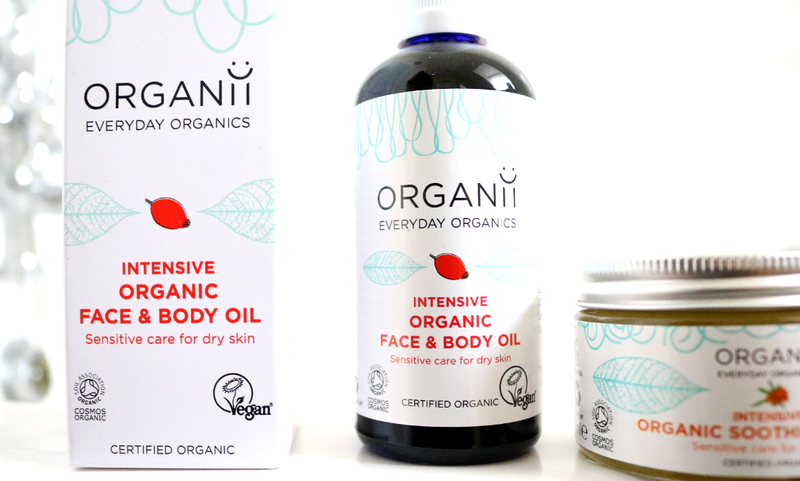 With the recent snow and freezing temperatures, Organii's newest Intensive range couldn't have arrived at a better time to save dry skins everywhere! 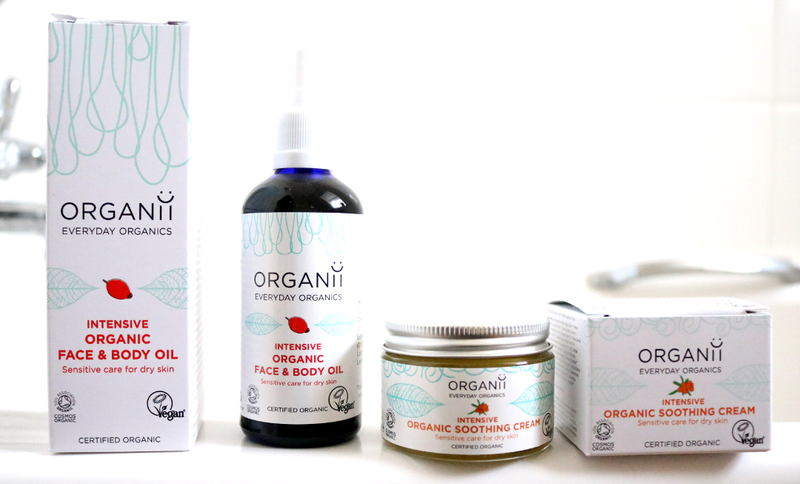 Organii are a fantastic natural and organic brand. I recently featured their Argan Shower Gel in my Cold Weather Skincare post, and the brand were kind enough to send me two of their brand new Intensive products to try when they found out that I had eczema. Specially developed by Hannah Pearson, (a fellow eczema sufferer, natural health consultant and herbalist), Organii's latest Intensive range currently comprises of two beneficial products designed to help soothe, moisturise and protect very dry, sensitive and eczema prone skin types. I've had eczema ever since I was a young child, so I'm always on the lookout for natural products that will help, especially as my flare-ups tend to get aggravated by the colder weather. When these two newbies landed on my doorstep last month, I couldn't wait to slap them on! Oils are amazing for dry and sensitive skin types and I frequently use many oil-based products all over my body and on my face. This one can be used anywhere and everywhere and is free from a long list of common 'nasties' and irritants, so it's as gentle and kind to your skin as possible. It's also been formulated without nut oils which is interesting to see as many natural brands regularly use Argan or Almond Oils as a base ingredient, and whilst I have no problems with these, I can appreciate that they can't be used by those who have a nut allergy. Instead, this Face & Body Oil is made up of just five ingredients; cold-pressed Sunflower Seed Oil, cold-pressed Rosehip Seed Oil, Nettle Leaf extract, Chickweed extract and Ribwort Plantain Leaf extract, making the overall composition 100% natural and 100% organic (certified by the Soil Association and Cosmos Organic). The oil feels very light and is easily absorbed into the skin with a quick massage, bringing instant relief to itchy areas and helping to reduce any inflammation. Being free from essential oils means that it doesn't really have much of a scent to it, and I find that this product is particularly beneficial for people who have larger areas of dry skin and eczema to cover, as the oil spreads so easily over these without leaving the skin feeling sticky or greasy. 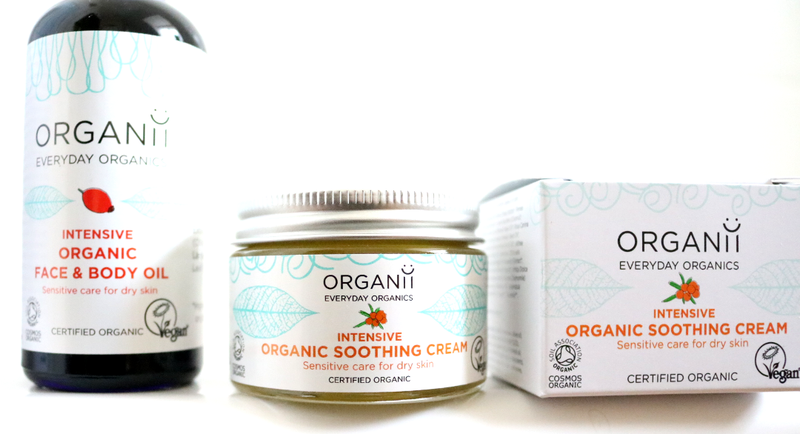 If you prefer a super rich cream to treat your eczema or dry skin, the new Intensive Organic Soothing Cream is a wonderful concoction of cold-press hypoallergenic oils and plant-based butters. This award-winning formula is exactly the same formula as the well-known Gentle Green Soothing Cream and has now been made especially for Organii's Intensive range, so you know it's one that can be trusted to work! It includes a range of ingredients which have been proven to have natural anti-histamine, anti-inflammatory and antibacterial properties, making it suitable for those who have eczema, psoriasis and rosacea, plus you can use it on any rashes, stings, burns, scars, stretch marks and wrinkles to treat and nourish. It really is a powerhouse multi-purpose cream that's packed full of some of nature's most skin-friendly ingredients such as Shea Butter, Avocado Butter, Coconut Butter, Chamomile, Manuka, Sunflower Seed Oil, Rosehip Seed Oil, Hemp Seed Oil and Seabuckthorn Oil to name but a few. It's perhaps no surprise, but a little of this goes an incredibly long way and it hydrates and soothes like a dream. I like using this on really sore patches and leaving it on overnight to do its magic - it works a treat! Have you tried anything from Organii?